Aton Resources Inc. is very pleased to report that assay results for the early holes in the current drill campaign encountered excellent gold-silver mineralization. Figure 2. Geological map of western Hamama West showing drill holes AHA-59 & AHA-60"
Drilling commenced on the 31st March with diamond drill hole AH-59 which targeted the Gold Oxide Cap north of and down dip from AHA-34 at Hamama West. AHA-34 had intersected 9 meters at 1.3 g/t Au and 70.6 g/t Ag in a previous drill campaign. Drill hole ANA-60 was sited behind AHA-59 to test the down dip extension to the mineralization. A drill hole further north again, AHA-61 was sited to test the mineralization down dip from both holes as shown in the cross section figure 1. Very interesting lithologies were encountered in each hole confirming the mineralization as being in a volcanic associated massive sulphide (VMS) environment. 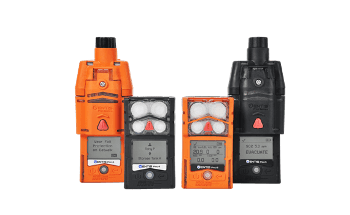 AHA-59 in the oxidized zone returned 5.1 meters at 0.89 g/t Au and 16.44 g/t Ag. Up-hole from the gold-silver mineralization, 3.8 meters of 0.79% Zn was intersected. Drill hole AHA-60 tested the deeper extension to this mineralization and returned 28 meters of 2.23 g/t Au and 42.2 g/t Ag in the sulphide zone. Up-hole from this are two narrower zones. These were 4.45 meters at 0.66 g/t Au with 19.94 g/t Ag; plus 6 meters at 0.65 g/t Au and 15.8 g/t Ag. Once again, zinc mineralization was encountered up-hole from the gold-silver intersections; in AHA-60 it was 23.5 meters of 2.5% Zn. Although there has been secondary migration and enrichment in the oxide environment, stratigraphically these zinc-rich zones are sitting under the mineralized exhalite unit that is carrying the precious metals. This is normal in a VMS situation. Drill holes AHA-59, AHA-60 and AHA-61 were drilled on the same section as previously drilled hole AHA-34 (9 meters at 1.3 g/t Au and 70.6 g/t Ag) but down dip from it. 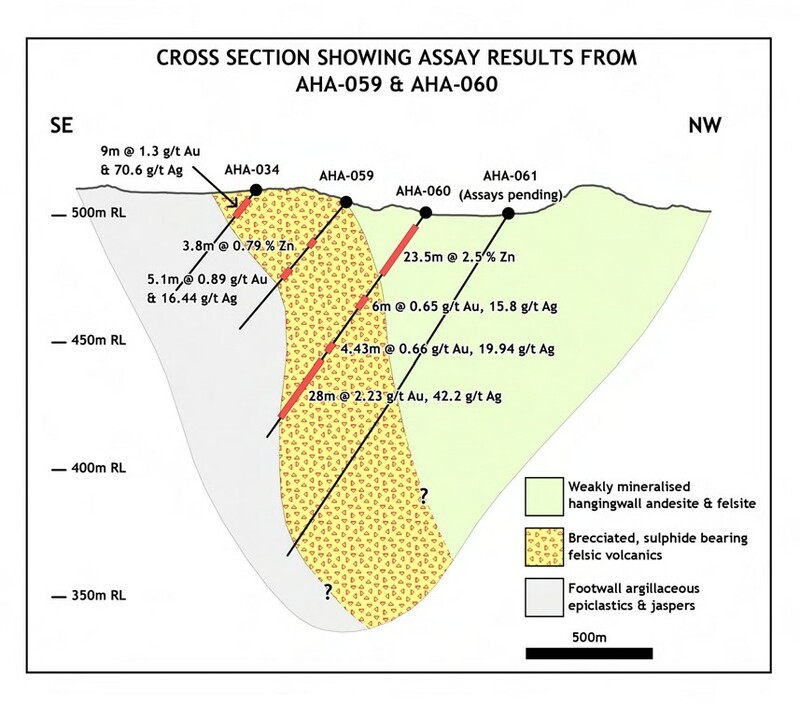 AHA-59 in the oxide zone adjacent AHA-34 returned 5.1 meters at 0.89 g/t Au and 16.44 g/t Ag. 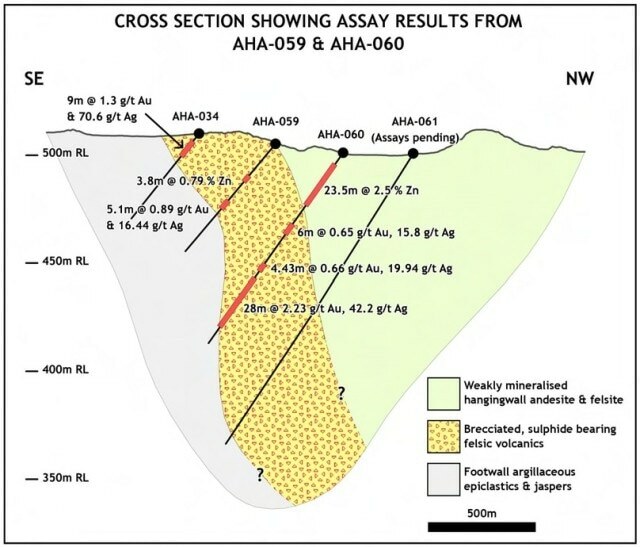 AHA-60 down dip again but in the sulphide zone returned 28 meters of 2.23 g/t Au and 42.2 g/t Ag showing a marked increase in thickness and grade. Results from hole AHA-61, down dip again, have not been received. See figure 1. The higher grade precious metal intersections are enveloped by a lower grade halo of mineralization. Thus, in AHA-60 the 17 meters at 2.9 g/t Au & 51.4 g/t Ag (1 g/t Au cut-off) sits within an intersection of 28 meters at 2.23 g/t Au & 42.2 g/t Ag (0.5 g/t Au cut-off). 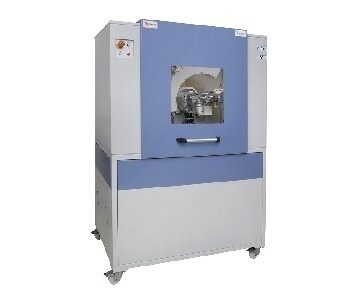 This in turn is enclosed in 37 meters at 1.8 g/t Au & 35.9 g/t Ag. (0.25 g/t cut-off). The mining cut-off will be calculated later during modeling. In both AHA-59 and AHA-60, elevated zinc values were encountered; 3.8 meters of 0.79% Zn in AHA-59 and 23.5 meters of 2.5% Zn in AHA-60. 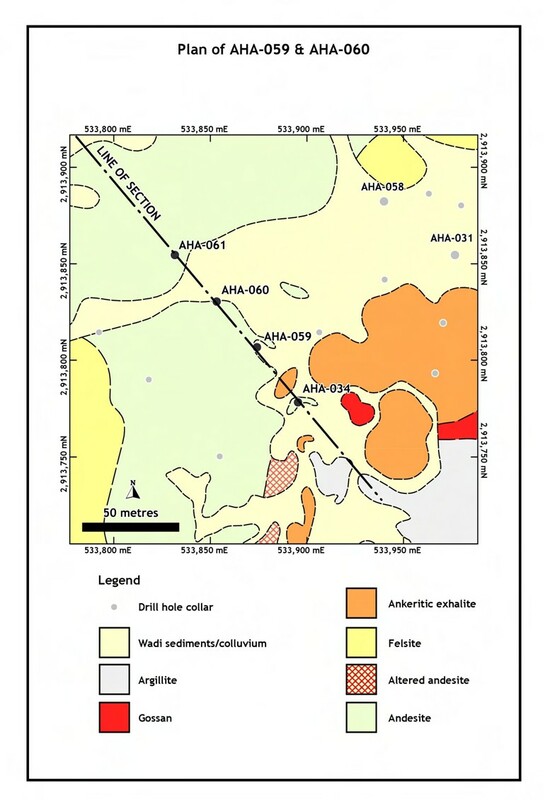 These zones stratigraphically underlie the gold-silver mineralized exhalite. Mark Campbell, Chief Executive Officer of Aton Resources stated, "These exciting results from Hamama West are confirming the potential of both the near surface Gold-Oxide Cap, and the deeper sulphide mineralization to host a significant resource. Further assay results are expected in the very near future and these should contribute towards the goal of achieving this. We have close to 3,000 square kilometers in two promising concessions that includes a number of old mines that we are re-assessing. Currently the exploration team is preparing to process the last of the samples from stage one of the 3,500-meter drilling program at Hamama West. We are excited to start stage two of the drilling program to carry on filling gaps in the drill pattern over the Gold-Oxide Cap and the deeper primary sulphide targets. We are on track to complete our initial NI 43-101 compliant resource estimate for Hamama West in Q3." 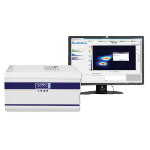 See the appendix for a full list of assays. The Hamama project lies within a belt of mineralization and old mines that extends east north-easterly for 40 km across Aton Resources' Abu Marawat Concession. The Main Horizon at Hamama has a strike length of some 3 km but extensions along the same stratigraphic horizon extend this to about 4 1/2 km. This stratigraphic horizon needs exploration to search for more occurrences. The Hamama mineralized horizon is divided into three main zones; Hamama West, Hamama Central and Hamama East. Mineralization at Hamama outcrops at surface, and at Hamama West is deeply weathered into a soft and friable oxidized blanket called the Gold-Oxide Cap, which extends over 900 m in strike length and has an average vertical depth of 35 m. Apart from the intersections announced herein, drill results in oxide at Hamama West include 37 m at 2.32 g/t Au and 107.1 g/t Ag in AHA-15, 32.6 m at 1.37 g/t Au and 56.4 g/t Ag in AHA-37 and 19 m at 2.46 g/t Au and 157.3 g/t Ag in AHA-46. Preliminary metallurgical (bottle-roll) test results on the Gold-Oxide Cap returned up to 92.2% Au and 65% Ag recovery by cyanide leach from oxide (see January 13, 2015 News Release). Primary sulphide mineralization at Hamama West returned such intercepts as 48 m at 1.45 g/t Au and 31.8 g/t Ag in AHA-23 and 88 m at 1.11 g/t Au and 118 g/t Ag in AHA-31 (see News Release dates May 12, 2015). The last drill hole from the 2015 drilling program, AHA-58, was entirely mineralized, from surface to 210 m depth, and includes 39 m at 1.64% Zn, 0.25 g/t Au and 25.7 g/t Ag (53 m to 92 m), 12.3 m at 2.49% Zn, 0.29% Cu, 0.26 g/t Au and41.4 g/t Ag (92 m to 104.3 m), 43.5 m at 3.70% Zn, 0.23% Cu, 2.61 g/t Au and 150 g/t Ag(112.5 m to 156 m) and 50.7 m at 0.69 g/t Au and 29.7 g/t Ag (160 m to 210.7 m).